Click on this image to get to know Jay and Mitosu Crafts! Welcome to the Crazy Crafters' Blog Hop with our Special Guest stamper, Jay Soriano - we are thrilled to have Jay join us this month and so excited to CASE (Copy And Selectively Edit) any project that has been created by him. I'm so excited (and also a bit intimidated!) 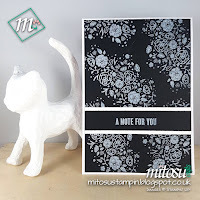 about this Blog Hop - when I discovered Jay was to be our Guest Stamper I actually squealed - because I just LOVE his work (always imaginative, beautifully executed and brimming with inspiration) and have been following Jay and Barry at Mitosu Crafts for a long time. So it was extremely difficult to choose which amazing piece to CASE! Eventually I chose this one because it would lead me to do something new for me. 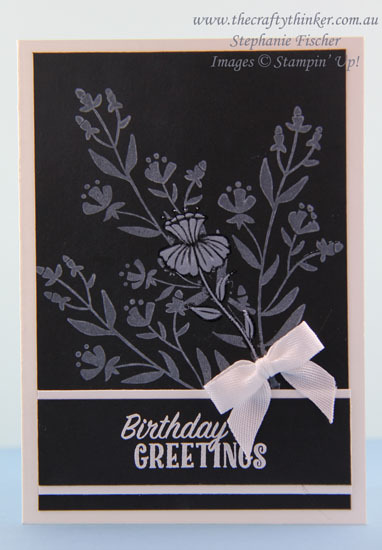 I clear heat embossed the centre flower and masked it before stamping the other image three times with Whisper White Craft ink. I then removed the mask and, using a paintbrush, coloured the centre flower with the same white craft ink, building up layers of pigment. If I were to do this again, I would stamp off the image directly behind the centre flower. As always when using white craft ink, care needs to be taken to avoid smudging as you work because it takes a long time to dry.